Here’s another blue watch that we feature on WatchPaper on the same day; blue seems to be the colour of this year and I have nothing against this trend. With its bold lines, this CEO Tech in a limited edition of 888 pieces is honouring the Turkish acting star and TW Steel brand ambassador Kivanç Tatlituğ. W Steel’s continued relationship with brand ambassador, Turkish acting star Kivanç Tatlituğ, has resulted in the production of another exquisite timepiece in his honour, the all new CEO Tech Kivanç Tatlituğ Limited Edition (CE4016). 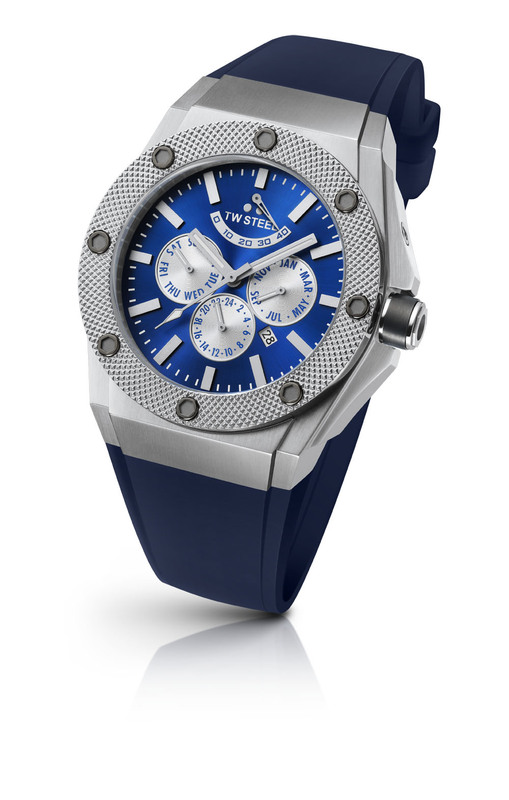 Limited to a production run of just 888 pieces – based simply on the fact that the number eight is the ‘lucky’ number of the 29-year-old – a major star in the Turkish community and award winning actor, the brand new 48mm model also follows the success of his previous TW Steel special edition timepieces, also from the CEO Tech collection, CE4003/CE4004 and CE4005, introduced late 2011. With a bold, contemporary feel to it, the CEO Tech Kivanç Tatlituğ Limited Edition uses the state-of-the-art Miyota 9100 Multi Function Automatic movement featuring the day, month, 24-hour time and date as well as a power reserve indicator situated at the top of the dial highlighting the remaining power left in the timepiece. It also features 26 jewels with the winding component running on ball bearings with 28.800 A/h movements per hour (4 Hz). The movement is housed elegantly in a brushed steel case complemented with a hammered bezel. The screws and mid-piece of the crown feature PVD dark titanium coating for added appeal. It also sports a sapphire crystal, in keeping with the luxurious design of the piece, while the case back is engraved stating – Kivanç Limited Edition Automatic Sapphire. In keeping with a theme from his previous models, Kivanç’s love of the colour blue is incorporated once again with a dynamic sunray blue dial popping out, off-set by steel coloured indexes. Continuing the theme, a blue silicon strap with steel clasps further accents the overall feel of this stylish edition which is 10 ATM water resistant and comes presented in a luxurious CEO box featuring Kivanç’s signature. CE4016 (48mm) – Miyota 9100 Multi Function Automatic movement, brushed steel case, hammered bezel, screws featuring PVD dark titanium coating, sapphire crystal, sunray blue dial, blue silicon strap with steel clasp.